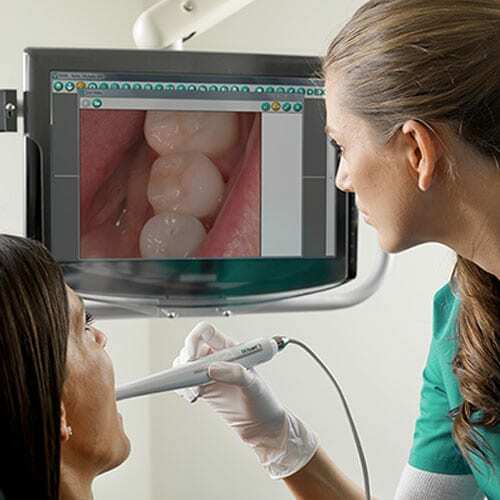 HOW CAN AN INTRA-ORAL CAMERA HELP YOU? This small video camera allows us to instantly photograph any areas of concern in your mouth – both periodontal and restorative. Because the images will be enlarged and displayed on a monitor, Dr. Jaleel and you will be able to both get a good look inside your mouth. The camera can even take a photograph of a specific region and a copy can be given to you. This way, any area of concerns can be easily shown to you via the monitor so you are better informed on your dental health. We use two types of laser therapies in our office. On tooth structure we employ a hard tissue laser that uses light energy to remove decay and clean the teeth, frequently to eliminate resistant stains. The hard tissue laser can often be used painlessly with little to no anesthesia. The application of soft tissue lasers in laser dentistry allows Dr. Jaleel to perform a wide variety of dental procedures that she otherwise may not be capable of performing. Soft tissue laser technology in dentistry has become so important through incorporating state-of-the-art precision into a number of common and not-so-common procedures. Dental soft tissue lasers can reshape gum tissue to expose healthier tooth structure, referred to as crown lengthening. Such reshaping provides a stronger foundation for the placement of restorations. The recovery time with using lasers is short and Dr. Jaleel is constantly upgrading laser equipment to provide the best oral care. The KEY3+ Laser helps Dr. Jaleel to perform periodontal (gum disease) treatment. Relaxed patients are happy patients. The intelligent approach of KEY Laser 3+ guarantees patient satisfaction. Laser activity is focused on affected areas only. Healthy root cement remains untouched by this extremely gentle treatment. Laser technology was a quantum leap for dental science. The KaVo KEY Laser 3+ feedback system is a quantum leap for dental laser technology. It means that dental science now, for the first time, has an instrument with which critical procedures can be completed more quickly, more reliably and more thoroughly, with the maximum of comfort and no impact on healthy substance. Treatment can be completed in a single session.